Sure, we’ve all heard of Digital Marketing and its ability to impact, but most people don’t reasonably grasp its potential. Just like traditional marketing, digital marketing is meant to be entrusted to a professional, who does regular reviews or evaluation reports to measure things like, growth and reach among other things. Earning a recognisable reputation with traditional marketing typically required years of practice and successful accomplishments with recognisable brands under your belt. With digital marketing, the campaigns are so frequent and the pace of change as well as the platform preference (Facebook, Twitter, Instagram, SnapChat etc) changes so fast, that the marketer is usually learning as they go – and adapting fast. Apart from digital marketing being an evolving space, it is very operationally intensive and execution-ally demanding, leaving professionals spread thin as they aim to rein in, a dynamically changing environment. So, what are challenges that add complexity to digital? Firstly, the pace of change is rapid and the digital space is evolving. “Digital technologies are doing for human brainpower what the steam engine and related technologies did for human muscle power during the Industrial Revolution,” says IT researcher and author Andrew McAfee in a Harvard Business Review interview. This is indeed the information age and the market that engages on digital platforms have become selective due to the sea of available options. Obtaining reach with digital platforms is easy…. Getting quality attention has become the challenge. Splitmetrics states that, “The number of apps is growing with a rate so rapid that an average Android user now has a choice of 1.6 million apps on Google Play.” The average android phone is a 32gig, and smarphone users access an average of 9 apps a day. This forces the typical android user to be decisively selective, putting pressure on app developers to create the highest relevance. Therefore the need for relevance in the digital marketing space has risen to new heights and participants need to be at the edge of the technology progression movement. How does this integrate with the way people interact with digital for matters pertaining to health? In a study, conducted by University of Glasgo, 40 young adults aged between 18 and 30 years old with experience of diabetes or common mental health issues (such as depression or anxiety) were interviewed. The study found that the consumption of health-related content through social media channels such as Facebook and online forums supported their knowledge and understanding of their condition. An increasing number of young people are turning to digital platforms to find health related information, no longer just relying on their doctor’s diagnosis. People are looking for solutions and trusting the advice from a single source is difficult to do. Health product manufacturers and retailers can leverage this by passing on its knowledge to the information hungry digital consumer. People want to know more and pharmacy’s that own its position as an advisor for its areas of expertise, will place the pharmaceutical industry as a whole, at an advantage. People visit a pharmacy, with 2 key missions: to Cure or Prevent. When patients look for a cure, they usually have a script or are in need of over the counter symptom relief. The cure shopping mission is once of urgency and convenience ranks very high. This means that the pharmacy is likely to enjoy a community of loyal patients. The preventative shopping mission is more leisurely, and range might rank higher than convenience. Both shopping missions drive feet into store and people are looking for advice and recommendations. 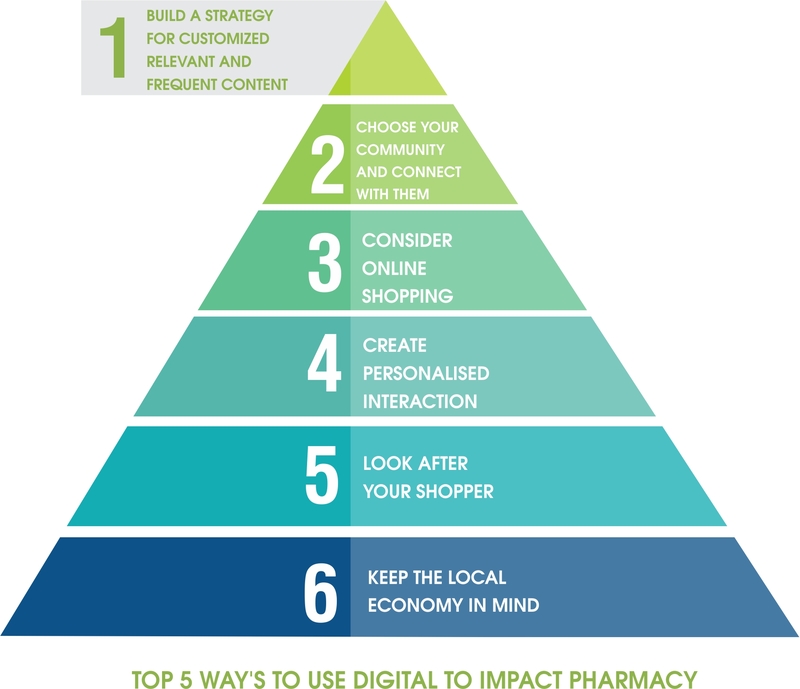 How can pharmacies develop a stronger presence with their shoppers and patients? The key with all digital is frequency and relevance to create expected and desired content. Developing a customised approach, which caters for the target market will achieve a far greater click through rate. Devote time to understanding the shoppers and what their lifestyle needs are along with what would interest them most. A survey of current patients to gain a deeper understanding will inform the digital strategy you use, down to the platform selection. Create a balance of communication between the cure seekers and preventative planners. 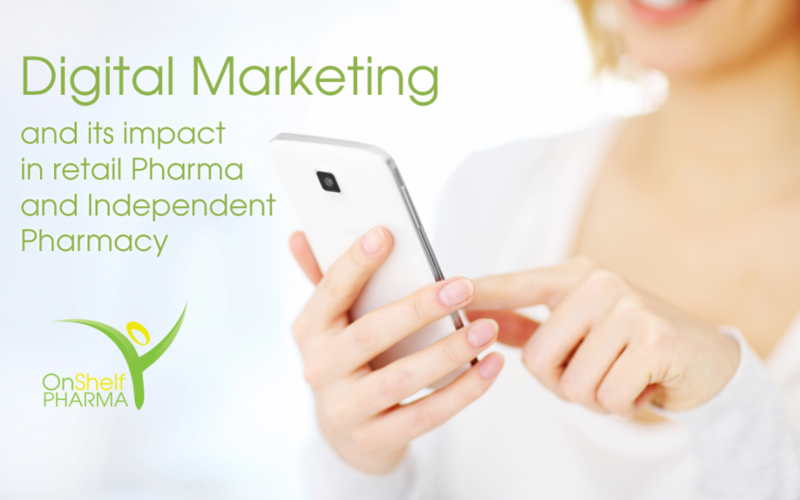 Establish an online presence and select the platforms that have the highest reach amongst the pharmacies community. Start building an online community. This typically starts with on-boarding the current physical shoppers/patients, and through sharing content and advertising, the community extends to potential shoppers. Start an online store. The convenience of being able to investigate a product and purchase it immediately will drive sales and extend the pharmacies appeal to the ever-growing online community of shoppers. An online store also allows the outlet to break geographical boundaries. By 2017 are expected to be 37% of US consumers would be happy for brands to collect their personal info and another 37% will search best price point online before making a purchase (Accenture). This is especially important for Millenials, Gen Z and Afrillenials. “The retail and consumer goods industries will change more in the next 10 years than they have over the past 40,” said Oliver Wright, managing director, global consumer goods lead, Accenture Strategy. With the extensive digital communication available today, it’s easy to become white noise. Stand out from the clutter by giving readers a customised approach so that there is familiarity between in person and online engagement. People also want human stories that they can identify with. GSK has a section on their website called “Our Stories” which talks about a variety of topics in an informal way. 5. LOOK AFTER YOUR SHOPPER The phygital concept is a massive one. How do we connect with customers in store (traditional and not one which will disappear in a hurry), and create support for them online too. The physical and digital shopper experience is key to win at each moment of truth. So, nurture the folks that prefer to come into store, by creating irresistible offers. E.g.) Dishem has just launched the VIB (very important babies) program on their website. This is an example of guiding the online community that they have built up over time, to store and benefiting from full basket. For every 10 packs purchased the 11th is free when you present your loyalty card. This was probably born from insight that a new baby brings love, hope and joy but also incremental expense. Considering current economic times, the Dis-chem VIB program is therefore a very relevant incentive for mums to shop. How do South Africans shop? How do they shop in pharmacy. We all know that the pharmacy shopper is a browsing shopper, compared to the typical shopper who takes 6 seconds to make a purchase decision OnShelf. Keep focused on delivering value to the consumer considering their current financial and economic constraints. Digital is a great way to connect with this consumer, keeping constantly top of mind, while adding value from a price and convenience point of view. Digital Marketing presents a big opportunity to the pharmacy industry to take on and own the space before it becomes cluttered. The digital revolution has transformed many industries and if people were given the option in the pharmacy segment, digital has the potential to transform how we engage with the industry. layout guide Heading – Centre, Introduction – justify, Bullet points – Left alignment.